You may know the Bakery Restaurant in Jefferson as an eatery. 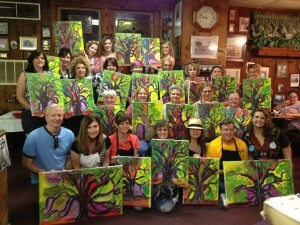 But the last few months it has become a hub for painting classes. Signing up for one of these classes may seem like a leap of faith and for some people it might just be. The evening begins with picking your spot and putting your name on an easel. Then it’s time to grab a dish of gumbo, rice, cornbread muffin and a drink or your own wine if you’d like. Because this was my first class, I will share my experiences and when you take the class you’ll have a fun evening just like I did. 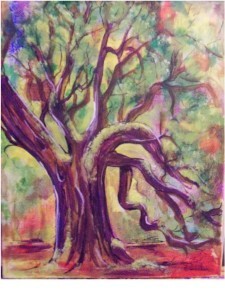 To begin the team from the Art Event explained the inspiration for the “Historic Old Oak Tree” which is a real tree in South Carolina called the Angel Tree with huge limbs that touch the ground today. 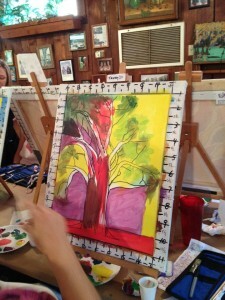 So we started off with their patent pending painting techniques and proceeded to putting the lines of the tree on the canvas. 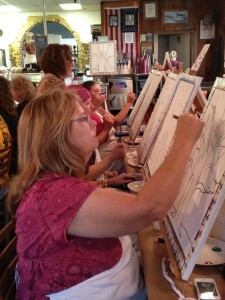 Lynn Fratangelo captured me drawing. Thanks Lynn. The use of paper rolling and twisting was definitely different and I have to say very interestingly creative and a fantastic idea. I am not going to tell you exactly what we did; you’ll just have to sign up for a class to learn for yourself. I am going to share my painting with you though. The White Oak Manor’s namesake coming to life. 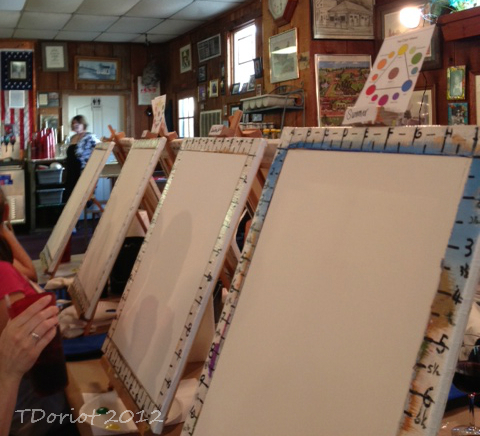 Lynn caught me adding some paint to my canvas. 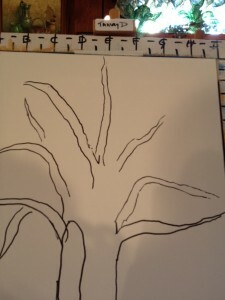 My painting starting to take shape. 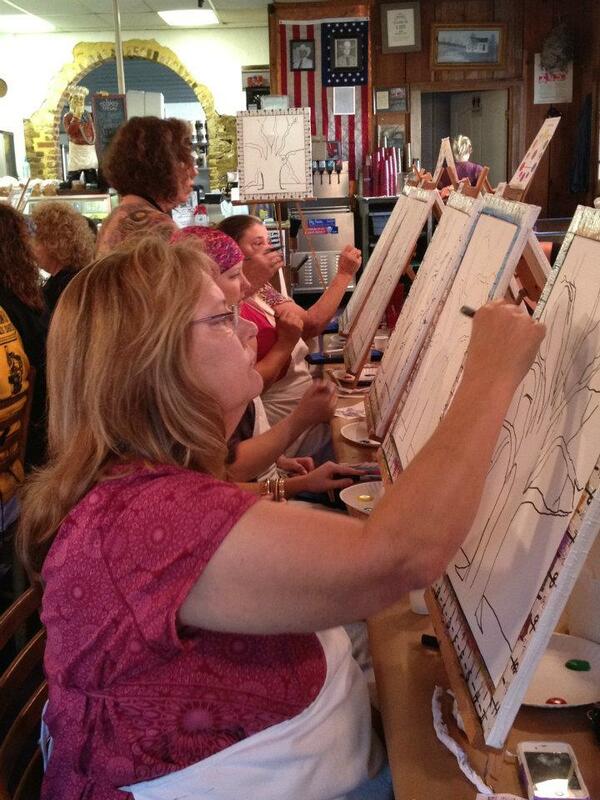 Watch for the next class schedule and call the Bakery Restaurant at 903-665-2253 for you reservation, you won’t be disappointed with the fun you’ll have. You can even paint half of the original with your partner like two couples did in our class. 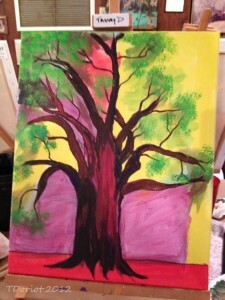 My painting looks different than the others in the class because I wanted it to look like our tree in the front yard at the White Oak Manor Bed and Breakfast. I think it looks pretty close. I am surely going to sign up for another class maybe I’ll see you there too. 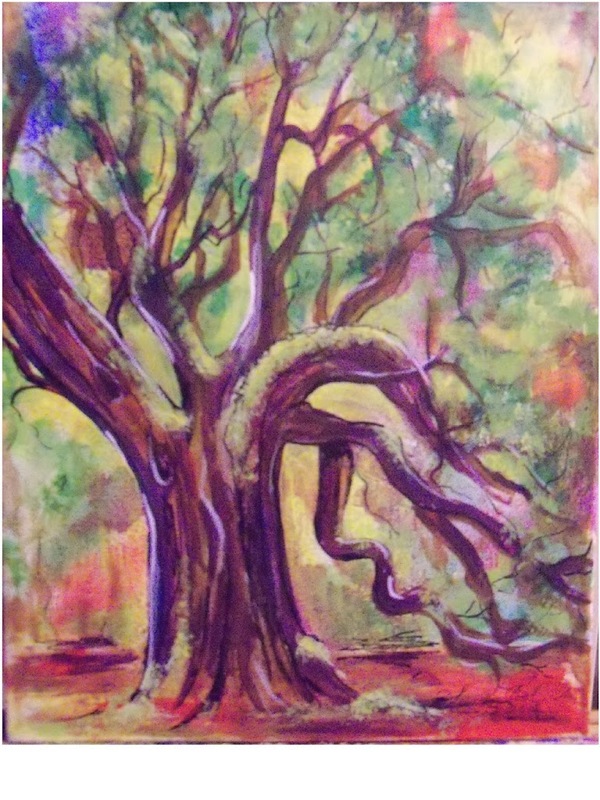 This entry was posted in Art Event Class by Tammy D. Bookmark the permalink.